The allure of low-carbohydrate, ketogenic diets is that they pay off quickly with rapid weight loss and tangible progress. Giving up all those tasty carbs, however, is tough. Artificial, calorie-free sweeteners can lessen any feelings of deprivation by boosting the flavor of your food. Before you add another spoonful of aspartame to your coffee or chug another diet soda, however, consider aspartame's impact on diets that induce ketosis. Ketosis is a metabolic state of starvation that occurs when your body is deprived of glucose, its primary fuel, and forced to burn fat as an alternative fuel. Many dieters have succeeded on a ketogenic diet because it does not require a lot of exercise and allows you to eat processed meats and other fatty foods not normally allowed on conventional diets. Ketogenic diets have been used successfully to decrease the risk of seizures in epileptic patients,. While scientists have yet to identify the mechanisms by which ketosis reduces epileptic seizures, they have given us a large body of research on the ketogenic response in the human body. According to the Epilepsy Foundation, ketosis is begun by a period of relative fasting that burns up nearly all available glucose circulating in the blood and stored as glycogen in the liver and muscles. Once glucose has been depleted, the body is forced to tap into fat stores for energy. In this state, ketones are formed in the liver and released into the bloodstream, putting you in a state of ketosis. In this state, appetite is suppressed, making a ketogenic diet relatively easy to adhere to once the state of ketosis is induced. Ketogenic diets are typically high in fat, deriving upward of 80 percent of calories from dietary fat. Aspartame is a calorie-free artificial sweetener found in diet soft drinks and other sugar-free products. According to an article by Alan Gaby, M.D., published in a 2007 issue of the "Alternative Medicine Review," aspartame is recognized as a triggering agent, along with alcohol and monosodium glutamate, that can knock you out of ketosis. On an already restrictive diet that requires you to forgo many of your favorite foods, relinquishing your diet soda may seem excessive. But Gaby contends that ketogenic diets only work if strictly adhered to. Both aspartame and ketogenic diets have been known to pose health risks. In an August 4, 2010 Huffington Post article, physician and author Dr. Joseph Mercola blasts aspartame as a deadly neurotoxin, citing episodes from its hard-won battle for U.S. Food and Drug Administration approval and numerous clinical studies linking it to brain cancer. The Epilepsy Foundation tells us that ketogenic diets have been known to cause menstrual irregularities in women, inflammation of the pancreas, decreased bone density, dehydration, kidney stones and gallstones.Lyle MacDonald, author of "The Ketogenic Diet: A Complete Guide for the Dieter and Practitioner," recommends drinking high volumes of water to offset dehydration. 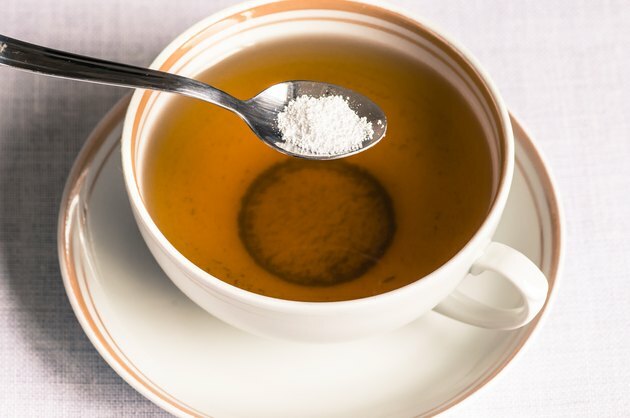 Does Aspartame Affect a Low-Carb Diet?